It’s that time of year again when those of us involved in writing and reviewing get asked by our various editors to make lists of the best and worst of 2018. By an astonishing coincidence, two concerts I attended on Sunday could easily have made it into both lists – one was really poor, the other really good – but my lists have already been submitted to the various magazines, newspapers, online portals and broadcasting outlets with which I am associated, so both have managed, this year at least, to slip through the net. As a matter of interest, while you will have to wait for the various publication dates to see what did make it to my best and worst lists, I can confide that the very worst concert I heard in Singapore during 2018 was one I did not review, while the very best I did review but, since the Straits Times only asks me to suggest my worst concert (I am apparently seen as the bad guy in local reviewing circles), I haven’t had a chance to include it. 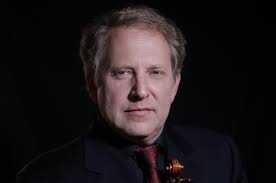 So, without in any way anticipating what will appear in print, my worst Singapore concert of the year was Shlomo Mintz attempting – by means of numerous stumbles, a breakdown and a complete sense of disconnection with both audience and music – to fumble his way through The Complete Sonatas of Eugène Ysaÿe in January, while my best was Kees Bakels transforming the Singapore Symphony Orchestra into something remarkably good and polished in his November concert, which presented the orchestra in a wholly different (and entirely complimentary) light. Back to the two concerts on Sunday. I was reviewing the 8th Singapore Lieder Festival for the Straits Times, and since that review will give my considered opinion of the two concerts, I confine myself to commenting here that while they studiously avoided singing much true lieder concentrating instead on weird and wonderful songs from all sorts of composers and all of which were more in the way of instrumental ensemble pieces, they really seemed to have bitten off more than they could chew. Every singer studiously followed their scores (mostly never even bothering to look up at their audience) and got their notes mostly right, but few of the performances went any further than that. In short, this was a concert of play-throughs rather than committed, intelligent performances. But then, in the pouring rain and howling wind, I rushed over to St Andrew’s Cathedral where the Cathedral Choir of the Risen Christ (whose normal domain is the Cathedral of the Good Shepherd) were presenting their Advent concert subtitled “The Joys of Christmas”. As I stood in the queue outside (having not had the chance to get a ticket in advance nor find an umbrella) quickly getting wetter and wetter, I found myself hoping I that it was all worth it. St Andrew’s Cathedral is an odd place, like a scaled-down English cathedral but seemingly embarrassed by its English connections; so they paint the inside a lurid blue and try to obscure its monuments to past worshippers whose names speak horribly of an England long gone, with copious TV screens and other 21st century electronic wizardry. But it has a warmth and charm which was enhanced last night by some exquisite lighting and the fact that it was packed to the rafters with an eagerly anticipatory, if communally dripping, audience. 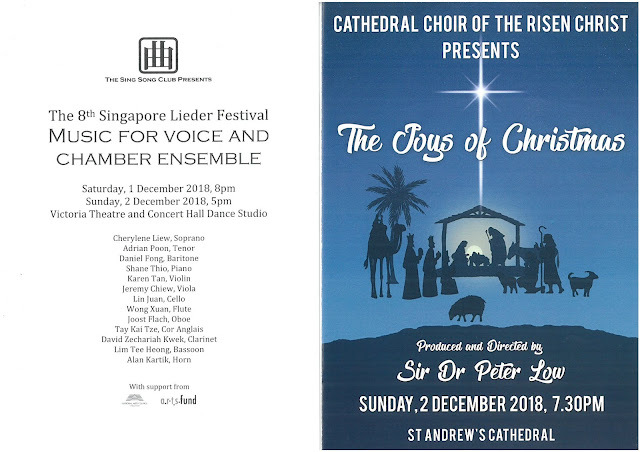 Choir Director Peter Low knows a thing or two about how to get through to a Singapore audience, and even his lengthy interval speech had everyone eating out of the palm of his hand. 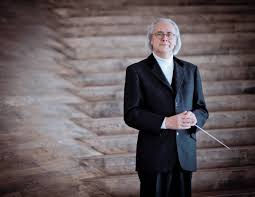 But what really reached out to the audience was the superb music-making he inspired from a choir which was both very large and vary varied in age. That age range was most vividly revealed at the very start when, as the choir itself processed rhythmically up the aisle (out of the corner of my eye, it looked awfully like goose-stepping in slow motion) seven tiny little girls, each a little older than the one before, sung a verse each of Joys Seven. The youngest singer was, I gather, just four, yet as with all of them, she sang perfectly in tune, enunciated her words flawlessly, and confidently maintained eye-contact with the entire audience – eat your hearts out lieder singers at VCH! – she also sung Stille Nacht in perfect German. In a perfect bit of choreographed timing, the processing choir reached their positions at the head of the nave just as the carol reached the seventh joy. The spell had been cast and was never once broken as we flowed seamlessly through the “Joy of Building a Nativity Tableau”, with beautifully delivered readings merging into impeccably sung carols. Musically the highlight for me was unquestionably a deeply moving and highly polished performance of Poulenc’s Quem Vidistis, but everything was sung with such perfection, such musical authority and such genuine sense of understanding, that it was as much a feast of superlative choral singing as it was a moving celebration of this most evocative moments in the church’s year. The second half of the concert was made up of a total of 33 carols in almost as many languages, from all over the world. If our lieder singers in the earlier concert had had difficulty sounding idiomatically French, there were no such issues with these singers, who switched between Ukrainian, Spanish, Finnish, Polish, Swahili, Xhosa, Italian, Portuguese…without turning a hair and always sounding utterly idiomatic. Add to that some wonderfully colourful costumes, some vivacious dances (which set the audience alight) and, above all, superbly accomplished choreography, and you have one of the very best concerts I have heard this year and unquestionably, the very best vocal concert by local singers Singapore has seen in 2018. If you don’t believe me, there is a second chance to experience this wonderful event when it is repeated at the Cathedral of the Good Shepherd next Sunday (9th December). I gather it’s pretty well sold out, but even if it’s pouring with rain, it is worth the queue outside in the hope of getting a ticket. Very interesting, thank you. And you wisely steered clear of the subject of what right-minded person styles themself as “Sir Dr”. Dear Anonymous1 and Anonymous2, it seems that we are all Keyboard Warriors. Anonymous1 trying to be a bit cheeky. Anonymous2 apparently unaware of the irony of their own hypocritical comment (let me guess, a regular at the Cathedral of the Good Shephard). Anonymous3 (myself) just feeling a public duty to point it out. You are most welcome. Hope you have plenty more musical thoughts to share in the New Year.